Haifa located in the north of Israel abut 92 kilometers from Tel Aviv, where Israel’s biggest international airport is (Ben Gurion Airport – almost 100 km (62 miles) away from Haifa). Most of the Haifa tourists arrive to Israel by air, landing at Ben Gurion Airport, where they then find a best way to get to Haifa. 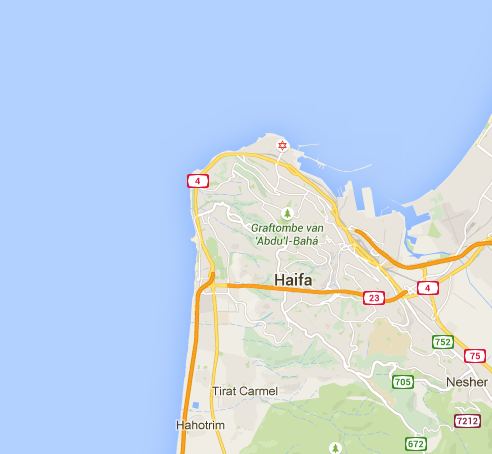 Usually, there is no point in renting a car in order to get to Haifa only: a train or taxi will sever you better. But if it’s a longer stay and you plan to go out of Haifa and see more of the northern Israel, you may want to be able to drive yourself around. Haifa direction is accessible in many ways, no matter how long you stay in Israel and whether or not Haifa is your first, last or only stop on the trip. There is a train station at the Ben Gurion airport with a direct train to Haifa. You can simply go out of the airport, get a ticket and hop on a train. This way is our favorite. Trains in Israel do not run all day and all week. If you arrive during the weekend the trains are not operating from Friday evening until Saturday very late at night. The train can drop you off only in one of the 3 Haifa train stations: Hof HaCarmel, Bat Galim or Haifa Center, but all of them are downtown (by the sea) and to reach your hotel you’ll probably need take another bus or taxi from the train station. Car rentals are available throughout the airport, but we recommend renting your car in advance before you arrive. It will usually be cheaper and you can be sure you have a car waiting for you when you land. You have two options if you wish to take a taxi to Haifa from the airport: a “public service taxi” and a “special taxi”. There is no direct bus line between Haifa and Ben Gurion Airport, so if you arrive to the airport and wish to travel by bus, you will have to take a bus to Tel Aviv first (plenty of lines that go there), get to Tel Aviv’s central bus station and then take any of the direct lines that go from Tel Aviv to Haifa. The faster alternative is to take a bus from the Ben Gurion airport to the “El-Al Junction” (only 5 minutes ride) and then catch the direct 947 line to Haifa from there (1.5 hours ride). Haifa has its own airport. The Haifa airport is a small one and flights to and from it are mostly done by one Israeli airline: Arkia and its daughter airline company: Israir. There are two other domestic airlines flying in and out of that airport: Lahak aviation and FNA. From (and to) the Haifa airport, Arkia usually flies domestic (to and from Sede Dov in Tel Aviv and Eilat in the south), but also to and from various destinations throughout the Mediterranean area. The Haifa airport offers flights to (and from) nearby Cyprus, Greece, Jordan and other close destinations. The City of Haifa plans to extend the runway as part of the Seaport and airport expansion plan so it will be able to serve other, more far destinations. For now though, you can use the Haifa airport as your point of entry if you are arriving from Cyprus or Greece, or if you began your Israel trip in Eilat. Alternatively, you can arrive from any other place in the world to the International Ben Gurion airport in Tel Aviv and get to Haifa from there by one of the many other ways detailed further ahead. Haifa is a port city. As such it is one of the landing bases for many cruise ships of various sizes and origins. Haifa’s sea port was ranked 4th in the world by the OECD in efficiency and every year it serves tens of thousands of passengers going in and out of the country by the sea.